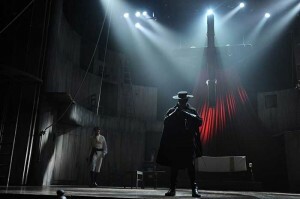 Zorro: A New Musical has claimed a lot of firsts for ETC’s Eos family of lighting control products. It was the first West End musical controlled by an Eos desk. It was the first large scale show in Paris run on an Eos. And now it’s adding another accomplishment to the list: Zorro is the first theatrical production in America to feature ETC’s newest lighting control desk, Eos Titanium (“Ti”). Ti was used to accomplish all programming for the show, running as a client in the theatre’s in house Eos system. Specified by the Alliance’s Chief Electrician Pete Shinn, the system includes an Eos RPU (Remote Processor Unit) as master, an Eos desk as a backup, Net3 Gateways, a Net3 Show Control Gateway and a Net3 RVI (Remote Video Interface).